40/55 euro per person (minimum 2 persons), for a double room including breakfast. * - 25% in the off season if you stay more than three nights from sunday to thursday. * 20 euro supplement for small dogs. You can have lunch or dinner at the Taverna de' Massari Restaurant located within our structure and is managed by the Gregori family, at an agreed price of 20 euros for the Casale Menu, or you can choose the dishes you prefer from the Menu à la Carte. You can purchase a special holiday voucher that suits your budget and the tastes of the person who will receive the gift: for example, an original package that takes in nature, art, gastronomy, sport or even wellness. 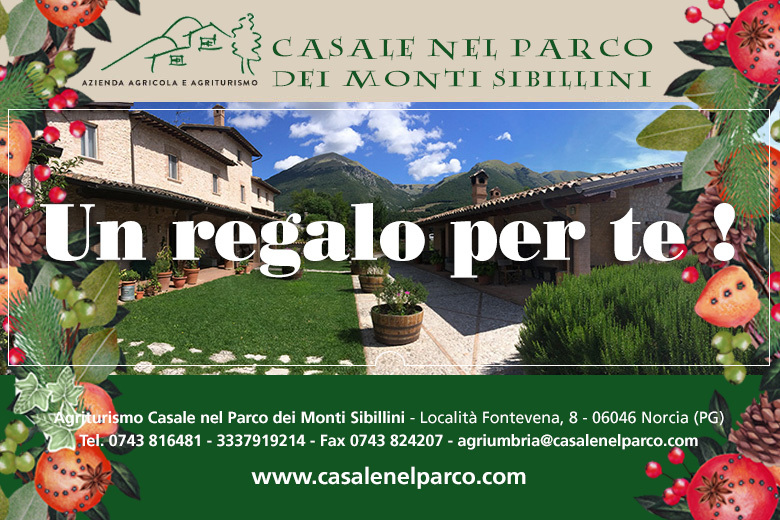 You can combine the allure of a holiday in Norcia, in the nature of the Monti Sibillini National Park, with the best of Umbrian specialities prepared with local products such as meats, cheeses, legumes, cereals, olive oil and the black truffle. It is possible to prepare a package that combines not only the comfort of staying in our house and excellent meals in the restaurant Taverna de' Massari inside our holiday farm, but also complementary services such as wellness massages, and excursions on foot, by bicycle or on horseback. You can also go truffle hunting with local expert truffle harvesters. Your friends or loved ones to whom you have given the gift of a holiday will receive, by e-mail, a personalised holiday postcard-voucher with the package consisting of whatever they like best of all: perhaps two days of sport? A relaxing and romantic weekend for a couple, with a fine bottle of Umbrian wine on arrival and massages included? A farm holiday with the whole family? Or a week of revitalisation? to prepare and customise your gift-package and for any other information.